People who work in large organizations know that most change doesn’t happen immediately or in broad sweeps. It happens incrementally by taking small, strategic steps. Prune the Future uses a tree as a metaphor to show how the future of anything can be shaped,one leaf at a time. 1. Before the meeting, cut a few dozen sticky notes or index cards into the shapes of leaves. Then, in a white space that will be visible to the players, draw a large tree with enough thick limbs to represent multiple categories of the future. 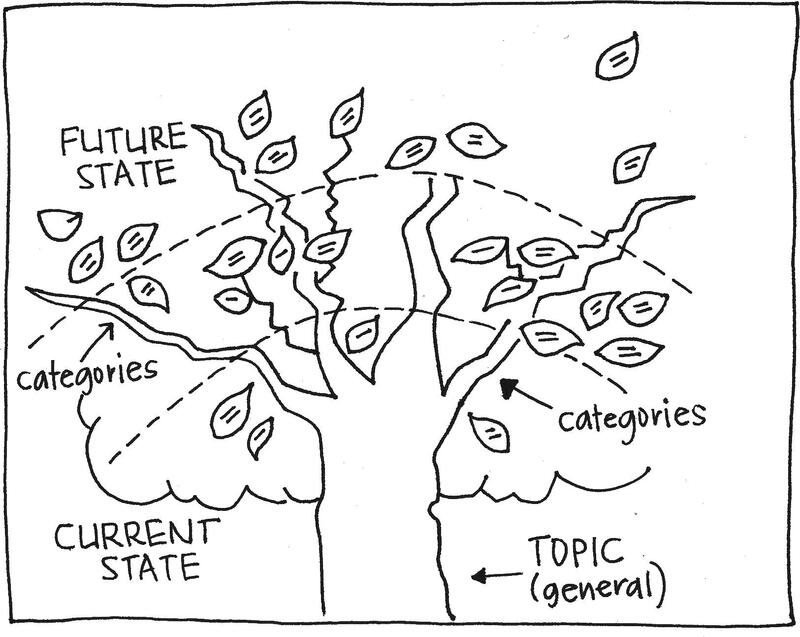 Write the general topic under or above the tree. 2. Tell the group that the inner part of the treetop represents current states of the topic and moving outward means moving toward the future. 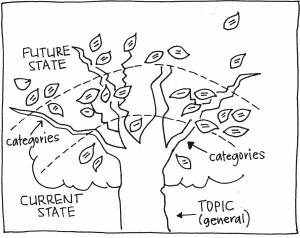 For example, if the topic is about growing the customer base, the inner leaves would represent the current customer demographics and the outer leaves would represent future or desired customer demographics. 3. Ask the players to write current aspects of the topic—one idea per leaf—on the leaves and stick them on the inside of the treetop. Remove any redundant comments and cluster similar comments, with the group’s guidance, near the appropriate branches. 4. Next, ask the players to write aspects of the future on new leaves. These can be future states or variables already in progress, or simply potentials and possibilities. 5. Tell the players to “prune” the future by posting their leaves around the treetop, related to the categories of the limbs. If you’d like, add thin or thick branches within to show relationships and let the tree grow in a natural way. If it grows asymmetrically, let that be. 6. With the players, discuss the shape of tree that emerges. Which branches have the most activity? Which areas don’t seem to be experiencing growth? Where do the branches appear to be most connected? The most disconnected? The picture of the tree is the working metaphor for this game—it represents the roots of the topic, the branches of the topic, and, of course, the topic’s growth potential. This game is broadly applicable because you can use a tree as a metaphor for virtually any aspect of your organization that you wish to grow or shape. The topic can be a product whose future features you want to brainstorm. It can be a team whose future roles and responsibilities you want to plan. Or you could use this game to discuss the marketplace and show where the players think it is changing or growing. When the players start to shape the outer treetop, encourage them to “go out on a limb” with their ideas for the future. This game is about possibilities—realistic and otherwise. And if someone requests fruit on the tree to represent ROI, draw apples where they should be. If the players request another tree (or even a grove! ), draw quick rudimentary trees and let the players start adding leaves, following the original procedure. This game works well because it allows for a nonlinear, organic representation of what is likely a complex topic. It results in a visual display of the interconnectedness of future conditions; showing where some parts of the tree may be suffering while others are thriving. The Prune the Future game is based on the Prune the Product Tree activity in Luke Hohmann’s book, Innovation Games: Creating Breakthrough Products Through Collaborative Play. Get started right away by playing Prune the Product Tree online! One of the important aspects of this game is tailoring the image – and meaning – of the tree to match the goals of your game. To illustrate online play, we’re going to use an “Event Benefits Tree”. Red Apples: Benefits you expected and got. Rotten Apples: Benefits you expected but didn’t get. Presents: Unexpected benefits that made the conference great. The multi-layered regions of this tree are designed to capture a variety of information about these benefits. Where did the players receive these benefits (at the conference or at work)? What was the nature of the benefit (personal or professional)? And what about the conference infrastructure – the roots of the tree (before the conference or after the conference)? By exploring these dimensions with players, you can create better conferences in the future. Don’t forget that this a collaborative game that allows you to invite other players to play. And when they drag something around – you will see it in real time! Of course, you will want to create your own trees after you’ve explored this one.